(Newser) – Women who regularly clean at home or professionally are damaging their lungs in a way comparable to smoking a pack of cigarettes every day for 10 to 20 years due to the inhalation of cleaning sprays, according to a recently published study out of Norway. "We feared that such chemicals, by steadily causing a little damage to the airways day after day, year after year, might accelerate the rate of lung function decline that occurs with age," study co-author Cecile Svanes says in a press release. Researchers looked at data from more than 6,200 people over 20 years. They found the amount of air women could forcibly exhale in a second and the amount of air they could forcibly exhale total declined faster in those who cleaned at home or professionally. 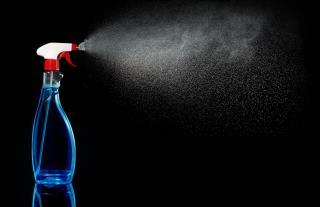 They also found asthma was 12.3% to 13.7% more prevalent in women who cleaned. This is a poorly done study. Junk Science. They grouped together housewives and women who clean "professionally". No doubt, cleaning women as a group have less education and less income, both factors that increase the risk of cancers. Any time a study is done like this there has to be a control group, or it is useless. Like this article. The picture is a liquid cleaner, not a spray cleaner. A pump nozzle does not make it a spray cleaner.